Lock in a great price for Ramada Resort by Wyndham Phillip Island - rated 8 by recent guests. Fantastic location and facilities for families. Something for everyone. Secluded and rooms felt like they were isolated even though we had others close by. Once again the unit was clean and comfortable and very quiet. There were plenty of facilities available but none that we actually had a use for. This is a great family getaway rather than romantic getaway. Loved the surroundings, family friendly, access to nature, amenities, atmosphere! The Location was excellent and we will come again. Love the way all the cabins were situated in the surrounding bushland. Made me feel like I was in the Australian Bush. 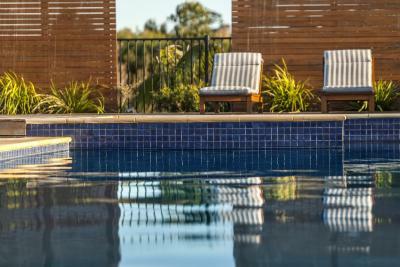 One of our top picks in Cowes.Set on 65 acres, 2 hours' drive from Melbourne city, Ramada Resort by Wyndham Phillip Island offers a restaurant, a swimming pool with a spa pool, a fitness centre and 2 tennis courts. The Koala Conservation Centre is a 2-minute drive away. Offering peaceful ambiance, this resort is surrounded by bike tracks and nature walks. Eco-friendly materials, as well as energy and water efficient appliances, have been used to minimise the impact on the environment. Ramada Resort by Wyndham Phillip Island restaurant 'The Café offers a relaxed atmosphere and stylish surrounds. Enjoy the fresh local produce and wines, and magnificent views of the surrounding countryside. Home to the MotoGP, World Championship Superbikes and V8 Super Cars, Phillip Island provides many activities and recreation options for guests. Ramada Resort Phillip Island is just a few minutes' from beaches, wildlife parks, and the famous Penguin Parade. 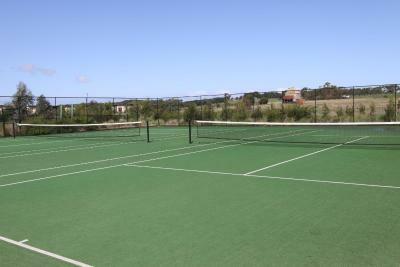 Ramada Resort by Wyndham Phillip Island has been welcoming Booking.com guests since 8 Apr 2009. When would you like to stay at Ramada Resort by Wyndham Phillip Island? This self-contained, 2-bedroom cottage features a separate living room with a satellite flat-screen TV. It also includes laundry facilities and a patio with outdoor furniture. A fully equipped kitchen, dining table and ceiling fans are also provided. This self-contained, 3-bedroom cottage includes a living room with satellite TV. It also includes laundry facilities, a fully equipped kitchen, ceiling fans and a master bedroom with an en suite bathroom. An additional bathroom with a shower over a bath as well as a patio with outdoor furniture are provided. This open plan studio features a flat-screen TV with satellite channels. It also includes a shower, spa bath and a patio with outdoor furniture. 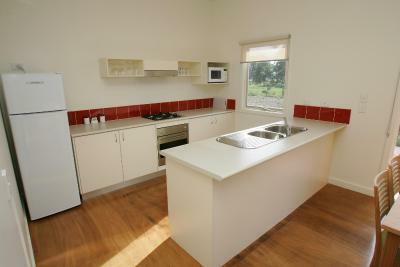 A fully equipped kitchen with a dishwasher, refrigerator, microwave, oven and tea/coffee making facilities are provided. This cottage features a patio deck with outdoor furniture, a fully equipped kitchen and a 6-person dining setting. It also includes laundry facilities, ironing supplies and a lounge area offering a flat-screen TV with cable channels. This studio has a microwave, dining area and kitchen. - 20% off Phillip Island Nature 3 Park Pass, and a discount booklet worth $120 savings at onsite food & beverage outlets. This bungalow features a DVD player, oven and dishwasher. This bungalow features a kitchen, dishwasher and microwave. This apartment has a satellite TV, DVD player and dining area. This apartment features a tumble dryer, oven and dining area. The Ramada Resort Phillip Island is situated only a short two hour drive from Melbourne, and is close to a variety of natural wildlife experiences, popular tourist attractions, swimming and surfing beaches, and breathtaking rugged beauty. 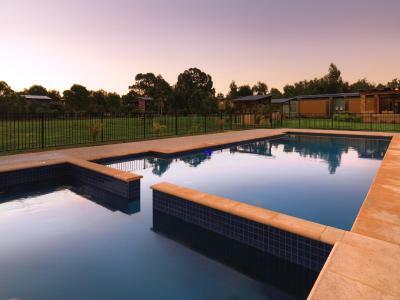 Ramada Resort Phillip Island is set amidst 65 acres of natural bushland, providing a private setting for guests. Guests can enjoy excellent facilities including an outdoor swimming pool and spa, a health centre with gym and spa, games room, children’s playground, two tennis courts, two picnic barbecue areas, plus an onsite restaurant, café & bar and pizzeria. For those who like to stay active and explore the surrounds, there are seven kilometres of walking and cycling tracks around the resort. With a relaxing environment where you can enjoy walking, cycling, bird watching and picnics, Ramada Resort Phillip Island is the perfect holiday destination for couples and families. 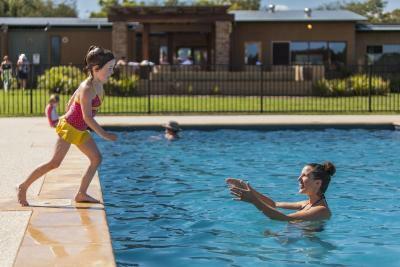 House rules Ramada Resort by Wyndham Phillip Island takes special requests - add in the next step! Ramada Resort by Wyndham Phillip Island accepts these cards and reserves the right to temporarily hold an amount prior to arrival. Please note that there is a 0.9% charge when you pay with a credit card. 1 child under 2 years stays free of charge when utilizing existing bedding. Cots/cribs are charged at AUD 25.00 per stay. If you expect to arrive outside reception opening hours, please inform the Ramada Resort Phillip Island in advance. Please note that Ramada Resort Phillip Island requires an AUD 100 credit card pre-authorisation upon check in to cover any incidental charges. Please note that not all rooms are air-conditioned and that rooms with air-conditioning are subject to availability. The resort was so dirty, unit hadn’t been cleaned. Dirt ,dust,cockroaches,food scraps left from previous guests & Lolly wrappers in couch /under cushions. Room missing basic essentials, spare toilet paper, not enough cutlery, crockery chipped. No blankets for kids, benches , cupboards , kitchen items not clean, sticky. No microwave containers to heat up food, no oven racks, trays. Had to ring reception & ask for things. Staff didn’t seem to care when we asked, complained. Pool area was dangerous, water everywhere. Puddles as you come through door. Need matting as I slipped. Roof above spa all peeling, looked terrible. Sauna & outdoor spa not working. Indoor spa, controls don’t work We asked for the oven racks& trays given to us dirty with food stuck to it, couldn’t believe it, Resort doesn’t look like it is in photos. Has dated, needs a lot of work . There wasn’t even a netball/basketball ring for kids considering how much space. My kids are teenagers took balls with them, couldn’t use. No lock on toilet & bathroom doors, often walked in on one another & shower had no curtain, glass so water went all over floor ,making a mess & dangerous. There was only 1 tv, my husband & I like to watch movie, kids sometimes like different movies & took Xbox to play games, so that made it difficult. Spiderwebs everywhere, very grubby, could see finger prints, grime. Oven thilthy, Power outlets not easy accessible, had to buy a power board to charge laptop. Smoke butts everywhere near entrance of our unit, looked terrible. Possum poo all over balcony & outdoor setting. Couch was all stained, grubby . The place needed a good scrub it really did. We had to wash crockery before using, it was chipped also . The crockery dirty as no dishwashing liquid, only a few dishwashing powder sachets. Again....had to ask, staff said they would bring things straight over.took 2hours. Other times didn’t even come. Not sure where we had to find the pool towels. Couldn't find any instructions. Maybe atv guide and some local brochures. This place was way over priced for what you get! Room floors are disgusting, sticky benches and table to a shower with no water pressure. Be on the lookout for ants in your cottage too. Don’t know how it has a fully equip kitchen? No privacy as they had cheap sheer roller curtains in living area. If I could give this property 1 star I would only for the staff! The noise of the wildlife outside at night - very loud and woke everyone up. We even had a possum in our cabin! All of the pools were freezing. They should at least be one heated. Of the 2 spas only 1 was working. Once again we were short on cutlery and crockery. Your staff need to be more vigilant when checking stock. Also the doona in the main bedroom was falling apart. Had to dispose of our own rubbish before checking out, clean our own dishes, did not have our bedroom tidied during the day while we were out and the price was extremely high considering what was actually available in the room we stayed. I felt that the room was over advertised and extremely under delivered. Villa outdoor lights were not working. SpA heater wasn't working also.